Author Dawn Kravagna has released Murderous Critters, her first collection of Cattle Capers ™ mystery stories on-line at Smashwords. 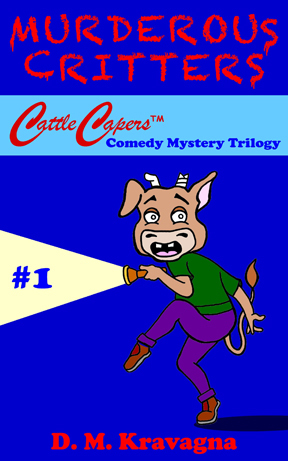 “Murderious Critters is a trio of outrageously funny mystery short stories, the first collection in a series featuring the zany comic animal characters from the world of Cattle Capers ™. A killer magician, rogue dinosaur skeletons, and roaming gunslingers are no match for bovine Master Detective Adam Steer and his goofy sidekick Crazy Cal.” The stories here include “The Magician’s Trick”, “The Dino Sore Mystery”, and “The Moontana Murders”, as well as the extra short story “Whopper Fish”.